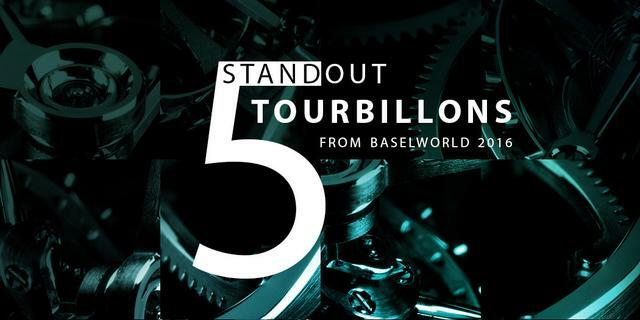 After a whirlwind week in Switzerland, team iW has narrowed down a few standout timepieces seen in the halls of Baselworld 2016. Today’s category focuses on one of the most complicated mechanisms, the tourbillon. Made to counteract the negative effect gravity can have on timekeeping precision, the tourbillon is an escapement packed inside a rotating carriage with the balance at the center. Our memorable tourbillons include models from Ulysse Nardin, Manufacture Royale, Arnold & Son, Breguet and Girard-Perregaux. Read on for a closer look at these miniature marvels. Sitting a mere 8.34 millimeters off the wrist, the Arnold & Son UTTE Skeleton is one of the thinnest skeletonized tourbillons now on the market. Limited to just 50 pieces, the UTTE Skeleton is powered by the A&S8220 caliber, a movement based off of the A&S8200. While the A&S8220 maintains its predecessor’s three-dimensional tourbillon cage and ultra-thinness, it was completely re-designed to achieve a skeletonize aesthetic, new tourbillon bridges and a modified main plate. The red gold case measures 42 millimeters in diameter and is affixed with a hand-stitched alligator leather strap with matching red gold buckle. Utilizing the brand’s renowned three-bridge design, the Girard-Perregaux La Esmeralda Tourbillon is an homage to the brand’s 225 years of watchmaking. La Esmeralda Tourbillon was directly inspired by the “The Tourbillon with Three Gold Bridges,” a pocket chronometer which won the gold medal at the Universal Exhibition in Paris in 1889. The GP09400-0004 powers the timepiece and its functions include hours, minutes and small seconds. The tourbillon is comprised of 80 components and rests at 6 o’clock. The case measures 44 millimeters in diameter and is forged from pink gold. The Manufacture Royale Micromegas is powered by the new MR04, which features two tourbillons—rotating at different speeds. The first cage, on the left, makes one revolution in six seconds. The second, on the right, completes its rotation in sixty seconds. The two are connected by a torque stabilizer that gets its energy from the barrel. In addition to its precision, the MR04 offers power reserve of approximately 80 hours that is maintained by automatic winding. Mesmerizing to watch, lovely to wear. Breguet pioneered an entirely new way of construction by building a timepiece around a predetermined sound with the Tradition Répétition Minutes Tourbillon 7087. The timepiece contains six new patents and five new elements including reworked gong springs striking vertically, toward the bezel. The timepiece also contains an acoustic chamber built into the case, which increases the sound of the minute repeater while filtering out sounds from the mechanism itself. Powering the Bréguet Tradition Répétition Minutes Tourbillon 7087, the caliber 565DR. The mechanism includes a bi-directional rotor located on the periphery of the movement and an inverted lateral lever escapement features silicon pallets. The Ulysse Nardin Grand Deck Marine Tourbillon, flies its nautical flag very high and was designed in collaboration with Christophe Claret. The timepiece features a central jump-hour window and a retrograde-minute in the form of a ship’s mast pulled with nanowire via pulleys and winches, traveling back and forth from 0 to 60. Ulysse Nardin then replicates the teak wood deck of a sailboat with wood marquetry on the dial. Oh, and there’s also a one-minute flying tourbillon rotating on that deck. The watch is both playful and technically interesting.